For the Pleasure of Seeing Her Again. Photos by Barbara Zimonick. Filling the National Arts Centre’s largest theatre space is no easy task, yet For the Pleasure of Seeing Her Again, written by Michel Tremblay and directed by Glynis Leyshon, had no problem packing the house on Friday night’s official opening of the Magnetic North Theatre Festival in Ottawa. 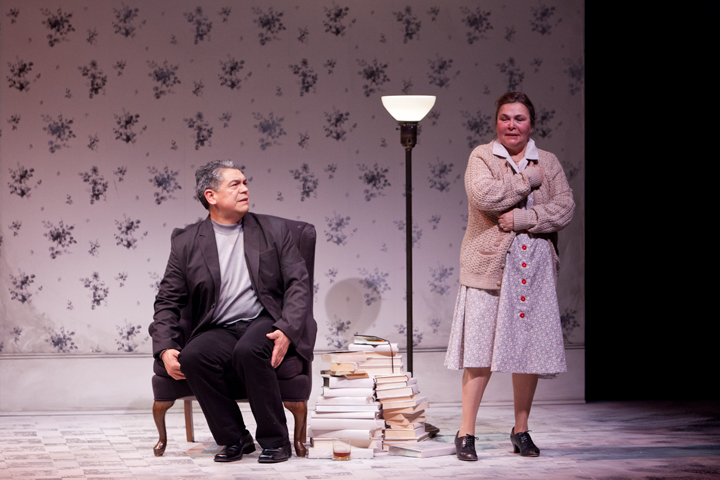 This particular performance is perhaps the most representative of Canada as a nation: it was written by a French-Canadian, translated into English (by Linda Gaboriau), and stars two household names in Canadian entertainment, Lorne Cardinal (Corner Gas) and Margo Kane (Moonlodge), both of whom are of aboriginal descent; it is clear why this particular production was included in Magnetic North’s line-up. Despite its slightly stale feel, especially in the middle section, I still believe that this show will be a strong contender for this year’s Audience Choice award. For the Pleasure of Seeing Her Again is a hilarious and heartbreaking homage to Tremblay’s late mother which he writes simply “for the pleasure of seeing her again”. The concept alone is enough to warm the coldest of hearts. We are brought into the world of the Narrator, as played by Cardinal, where we meet his feisty and often exasperating Nana (Kane) and we see how she is at once a source of annoyance, but more importantly his source of inspiration. Easily the most touching moment of the entire script is the beautiful exit the Narrator, or rather Tremblay, writes for his mother rather than watching her suffer again. Western Canada Theatre really does Tremblay justice. The set design, by Pam Johnson, is minimal and unassuming – nothing more than a single wall of flats, decorated with some drab looking wall paper that is intersected by one sliding wooden door which Nana uses to enter and exit the scenes. On stage right there is an unremarkable kitchen table with chairs and on stage left we see a handsome leather arm chair that is reserved for the Narrator. The dreariness of the set is effective in lulling the audience into a false sense of security and thus makes the big reveal towards the end even more exciting. The lighting, done by Gerald King, is also kept minimal in order to frame the piece and it changes only slightly between scenes with Nana and moments when the Narrator is talking directly to the audience. There were some odd choices, however, made in regard to the sound design by Bruce Ruddell. Though the piece is not sound-heavy by any means, I could have done without the seemingly random sound effects like the ringing telephone that pulled me right out of one of Nana’s stories. You can tell that Leyshon and the actors really understand this piece. The characters and their relationship to one another are clear and believable. Kane is vibrant as Nana, proving that she not only has the acting chops, but that she is also a talented storyteller. Cardinal as the Narrator transitions easily from child to teenager and finally to adulthood with much humour and the chemistry between Cardinal and Kane feels organic and easy. However, the physical staging, or the blocking, of this show leaves a lot to be desired. Cardinal sits in that handsome arm chair for almost 90% of the play, leaving Kane to try and fill the rest of the stage with her presence. I’m not sure if she was successful though as she doesn’t seem to stray too far from stage right. This show clocks in at just under two hours with no intermission and, if I’m being honest, about half way through the piece I was struggling to keep my eyes open. It’s not until Kane’s final entrance and the scene leading up to her grand exit that I become fully engaged again. I will say that this specific scene is the production’s redeeming quality. Having lost my own mother this past October in a very similar situation, I had a hard time getting through these final moments.Tremblay is a master of words and the actors deliver them beautifully. I honestly don’t think there was a dry eye in the entire theatre. If the audience’s standing ovation is any indication, this play was well received. Was I amongst those standing? No, and there was only a few of us who remained seated. I don’t give out standing ovations very often (though unfortunately they seem to be becoming the norm) and I thought while clapping through my tears that even though this play has touched me in an incredible way, up until fifteen minutes prior I was legitimately falling asleep. Still, I don’t want to dissuade anyone from seeing it. I think it’s a solid, fully realized production by one of our nation’s finest playwrights and it’s most definitely a crowd pleaser. Had Leyshon incorporated more movement and rhythm diversities on stage this production no doubt would have pulled a standing O out of me. For the Pleasure of Seeing Her Again is playing until June 11th.